This cover honoring the first day of issue for "Decade of Space Achievements 1961-1971) with a wonderful cachet by Art Craft Covers. 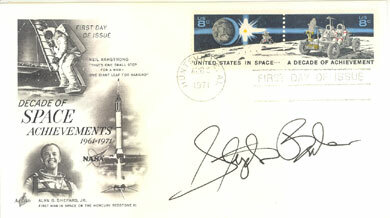 Cover was cancelled at Huntsville, AL on date of stamp issue and hand signed by Apollo 11 Flight Controller Stephen Bales. Bales as history will attest is best known for his critical role in the first lunar landing. 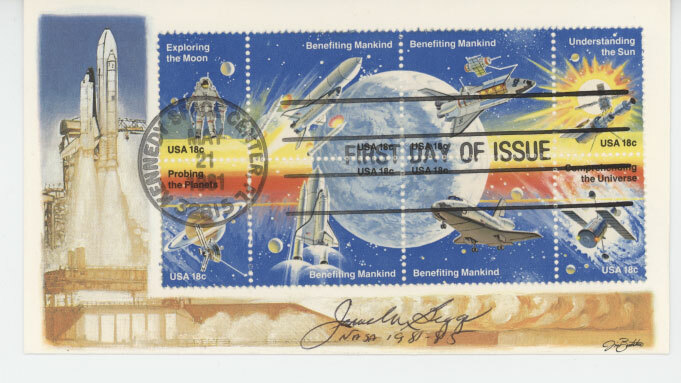 This Art Craft cover has been cancelled in Washington, DC on Sept 9, 1969 which was the first day of issue for the affixed "First Moon Landing" stamp. It has also been hand signed on Apollo 11's moon landing date of July 20, 1969. 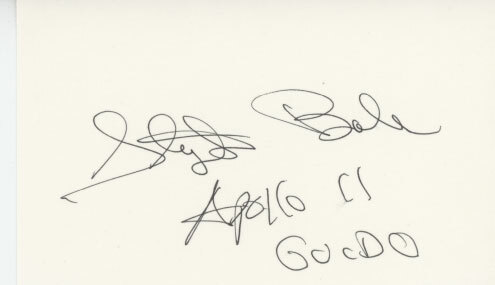 It is boldly hand signed by Apollo 11 Flight Controller Stephen Bales who adds "Apollo 11 Guido". Bales as history will attest is best known for his critical role in that first lunar landing. 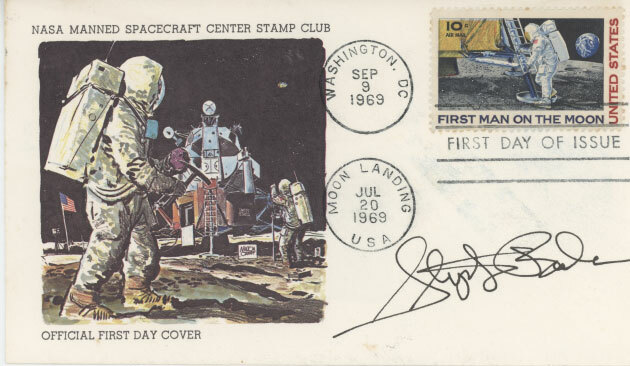 This MSC Stamp Club cover has been cancelled in Washington, DC on Sept 9, 1969 which was the first day of issue for the affixed "First Moon Landing" stamp. 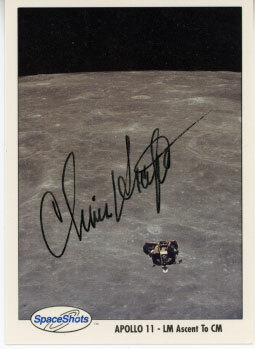 It has also been hand signed on Apollo 11's moon landing date of July 20, 1969. It is boldly hand signed by Apollo 11 Flight Controller Stephen Bales. Bales as history will attest is best known for his critical role in that first lunar landing. 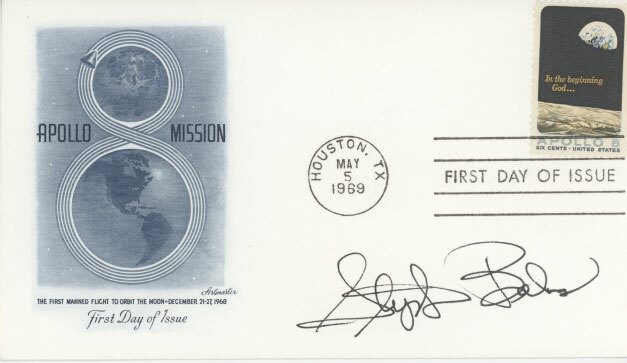 This Artmaster cover has been cancelled in Houston, Texas on May 5, 5, 1969 which was the first day of issue for the affixed "Apollo 8" stamp. It is boldly hand signed by Apollo 11 Flight Controller Stephen Bales. Bales as history will attest is best known for his critical role in that first lunar landing. 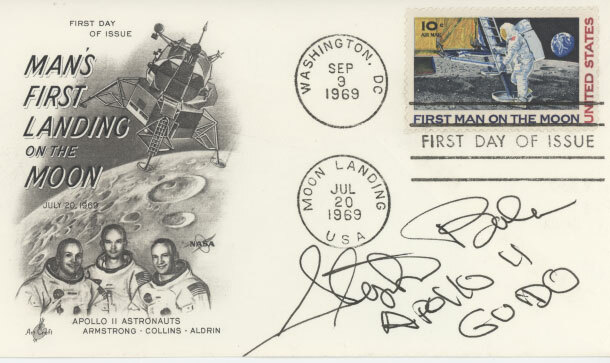 This 3"x5" index card has been hand signed by Stephen Bales who also adds, "Apollo 11 Guido". It is signed in ballpoint and is pristine condition. 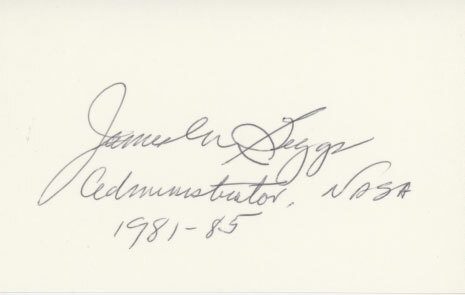 This 3x5 index card is hand signed by James Beggs who adds "NASA Administrator 1981 - 85". 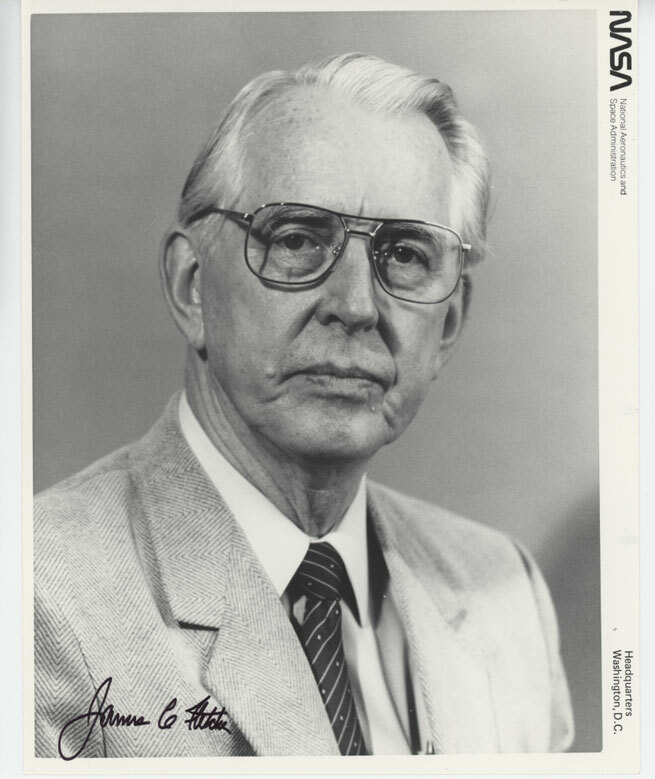 Beggs served as the 6th Administrator of NASA. Nominated by President Reagan on June 1, 1981, Beggs took his oath of office and entered the post on July 10, 1981, serving until December 4, 1985. 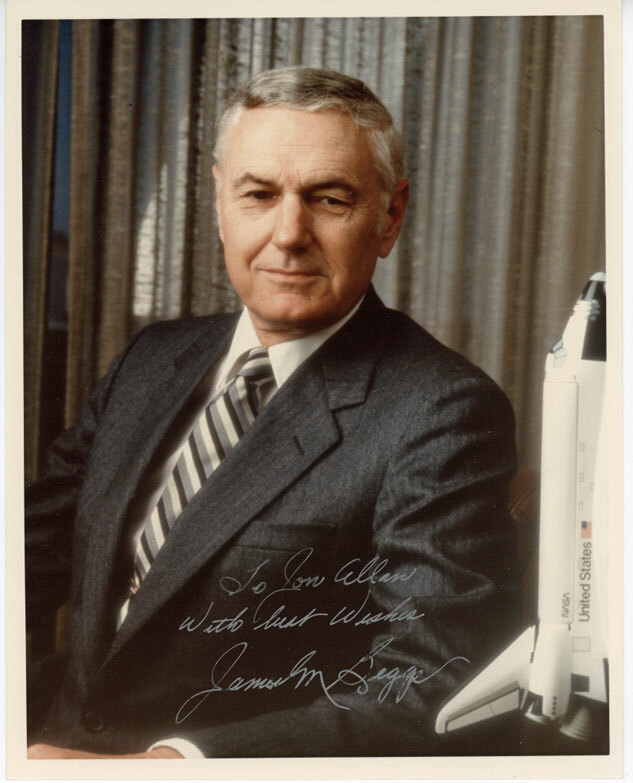 This 8x10 NASA photo is hand signed and personalized by James Beggs. He signs neatly with a silver pen in excellent contrast to his business suit. In excellent condition. 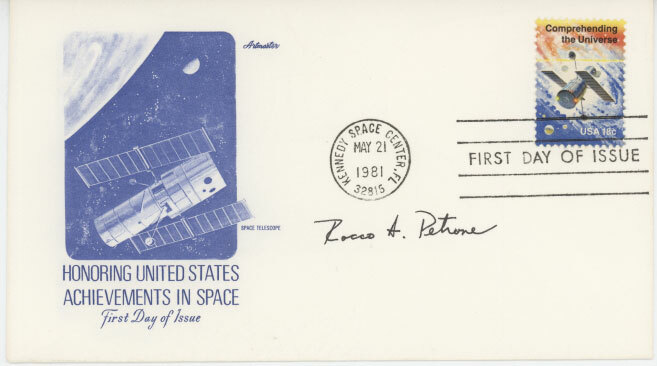 This beautiful and colorful Fleetwood cover with first day of issue stamp block was cancelled on 5/21/81 at KSC and is hand signed by James Beggs who adds "NASA 1981 - 1985. 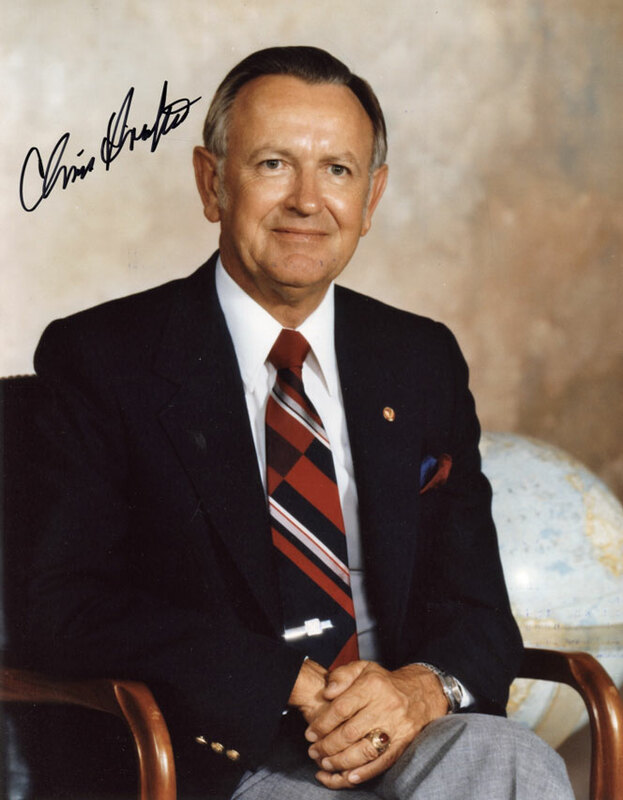 Beggs served as the 6th Administrator of NASA. Nominated by President Reagan on June 1, 1981, Beggs took his oath of office and entered the post on July 10, 1981, serving until December 4, 1985. Heritage Crafts cover with Apollo 14 cachet and crew likenesses. Cancelled on February 5, 1971 at KSC. This cover is hand signed by James Beggs who adds, "Good men all. Thanks for your support" and "Administrator 1981 - 85....Asso Admin 1968 - 69". Very nice. 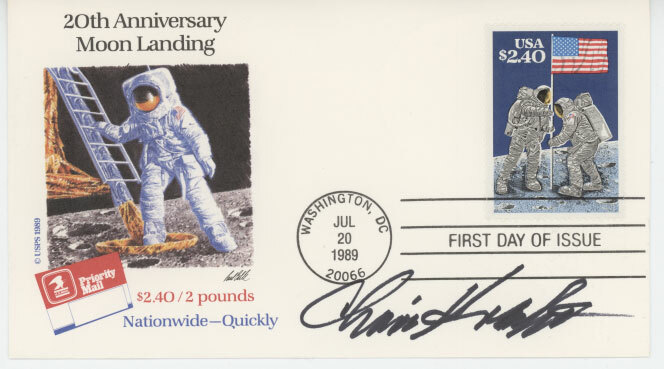 Artmaster First Day Cover for stamp commemorating the 25th Anniversary of the Apollo 11 moon landing. 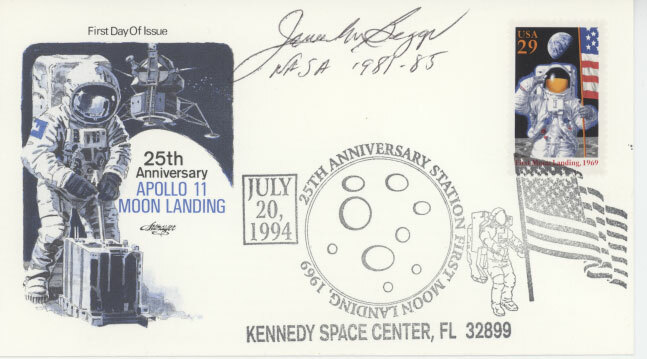 Cover is neatly hand signed by James Beggs who adds "NASA 1981-85"
Art Craft First Day Cover for stamp honoring "A Decade of Achievement". 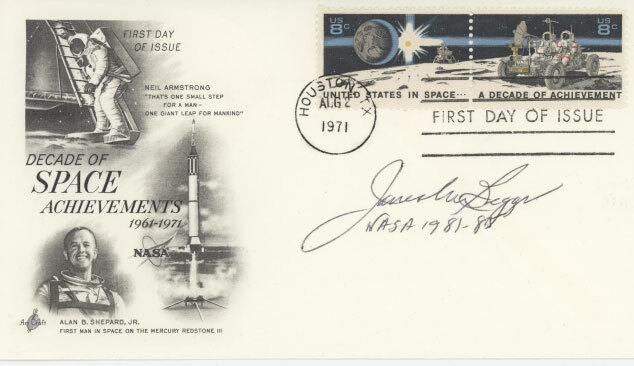 Cover is hand signed by James Beggs who adds "NASA 1981-85" Cancelled on August 2, 1971 at Houston, Texas. 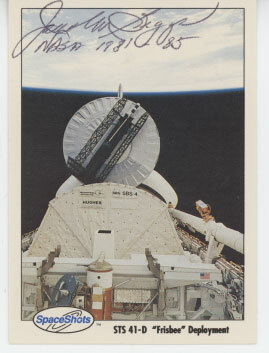 This SpaceShots Trading Card #0007 is hand signed by James Beggs who adds, "NASA 1981 - 85". It is in pristine condition. 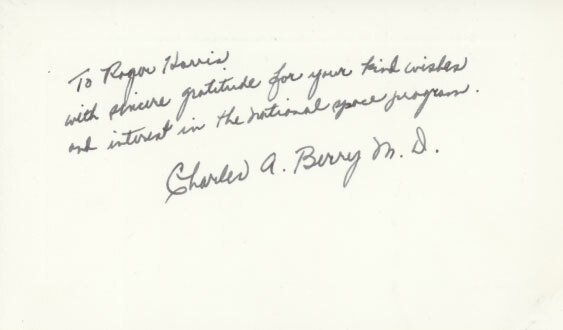 This pristine card on heavy stock is personalized and hand signed, "with sincere gratitude for your kind wishes and interest in the national space program" Berry's signature is beautifully executed as you can see in the scan here. 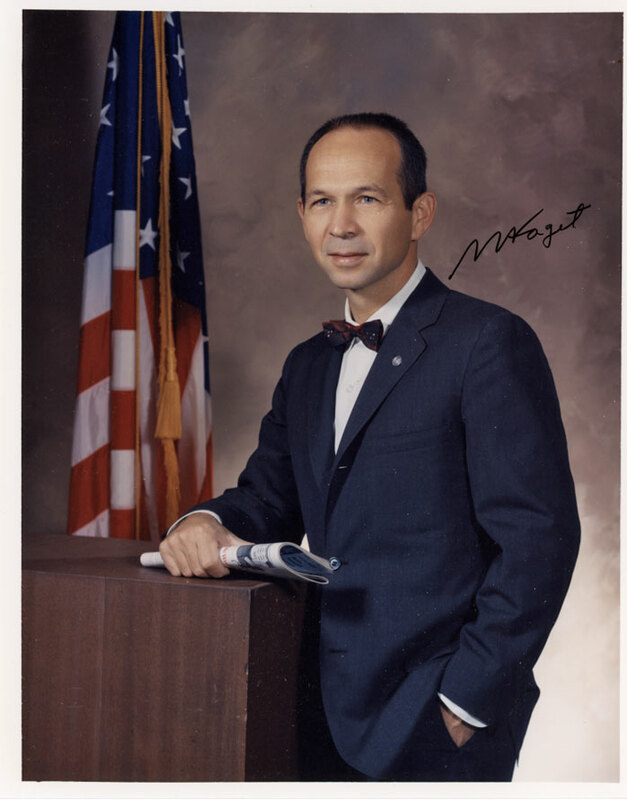 Offered here is a 3" x 5" color photo of Mercury Spacecraft Designer Max Faget. Faget has hand signed in bold black in great contrast to his image. 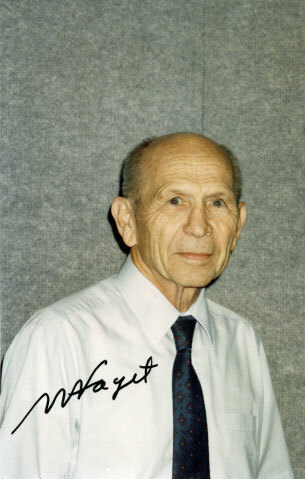 Faget is credited for having designed the original spacecraft for Project Mercury and for contributing to the designs of every U.S. human spacecraft from Mercury to the Space Shuttle. Mint condition. This 8" x 10" color glossy has been hand signed in black by Mercury Spacecraft Designer Max Faget. This is his official portrait. This wonderful studio shot image is in pristine condition. 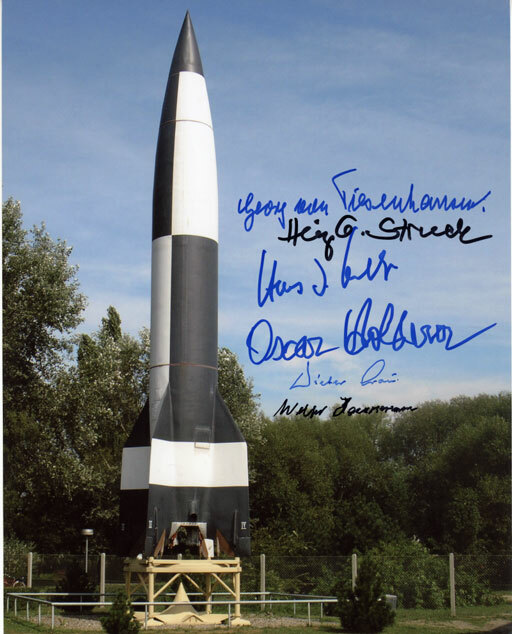 This 8" x 10" (bw) glossy has been hand signed in black by Mercury Spacecraft Designer Max Faget. This wonderful candid photograph is in pristine condition. 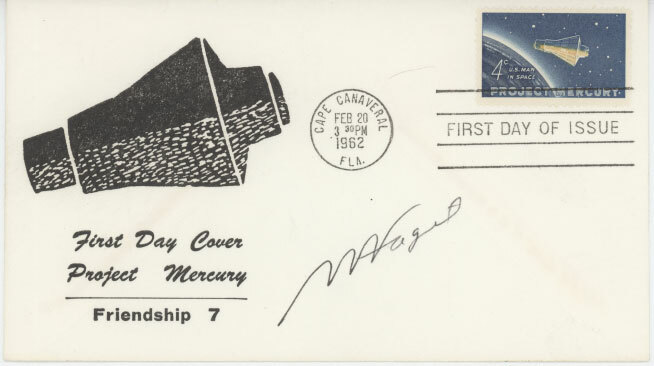 This vintage Project Mercury first day of issue cover was cancelled on February 20, 1962 (John Glenn's launch day) at Cape Canaveral, Fl. 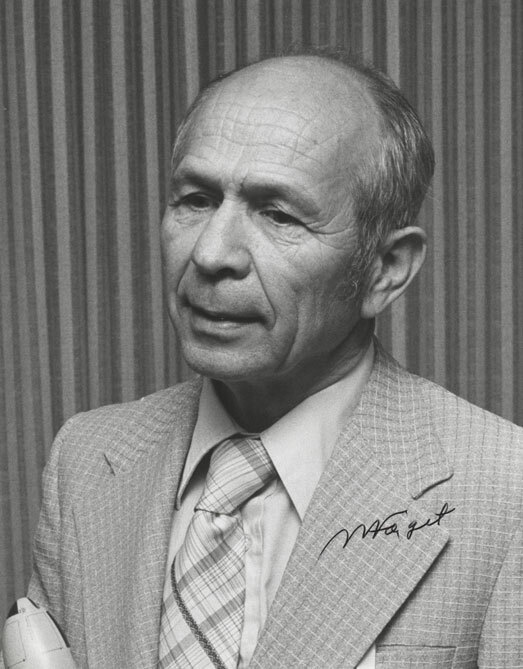 It is neatly signed by Mercury Spacecraft Designer, Max Faget. In outstanding condition. 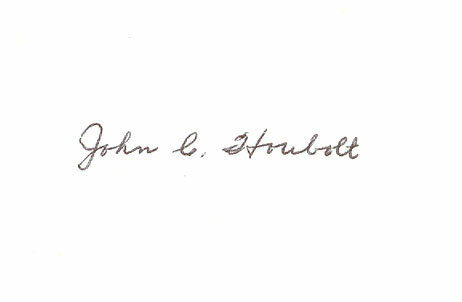 This 3x5 index card is hand signed by John Houbolt. Houbolt as you probably know was credited for having effectively promoted the lunar mission mode called Lunar Orbit Rendezvous or LOR. This flight path first endorsed by Wernher von Braun in June 1961 and was chosen for Apollo program in early 1962. This critical decision was viewed as vital to ensuring that Man reached the Moon in the 1960's, as President John F. Kennedy had proposed and in the process saved billions of dollars and time by efficiently using existing rocket technology. Great image of Chris Kraft at the console. Authentically hand signed in black sharpie. In pristine condition. This business suit portrait of Kris Kraft is beautifully hand signed in bold black sharpie. It measures 8"x10". 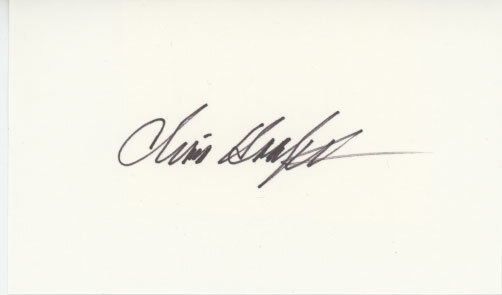 White unlined index card hand signed by Chris Kraft. Card measures 3" x 5". Pristine. 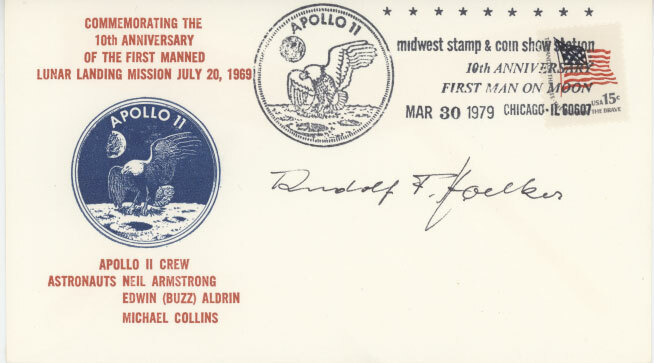 USPS produced first day of issue cover honoring 20th anniversary of Apollo 11 has been cancelled in Washington, DC on July 20, 1969 and boldly signed by Chris Kraft. SpaceShots Trading Card #0034 showing the return of Lunar Module Eagle to CSM Columbia following the crew's first ever moonlanding. The front of this card has been beautifully hand signed by Chris Kraft. 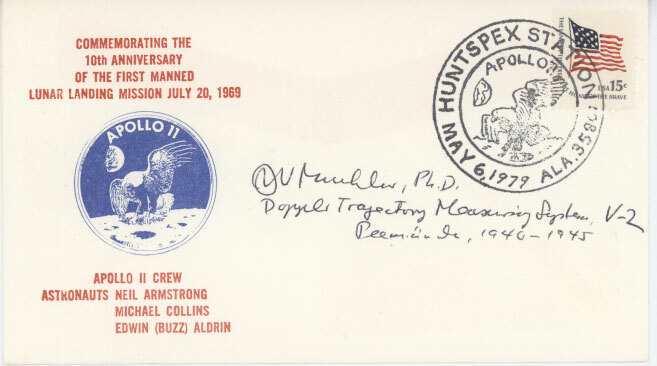 This Fleetwood cover featuring a cachet showing the Apollo 15 and cancelled Houston, TX on 8/2/71 honors the first day of issue for the affixed Decade of Achievement stamp. 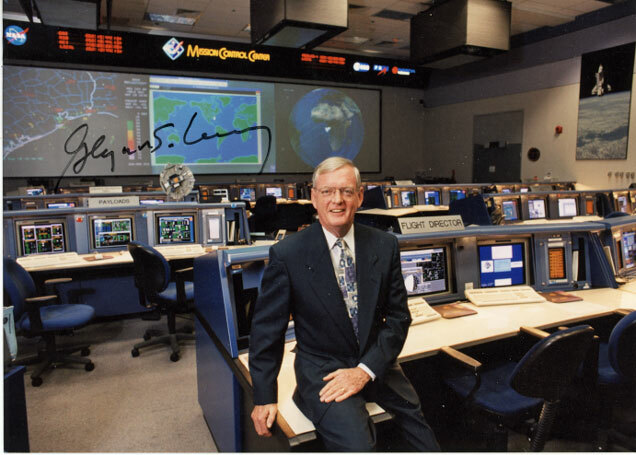 It is hand signed by Glynn Lunney who adds, "Apollo Flight Director" Excellent condition. 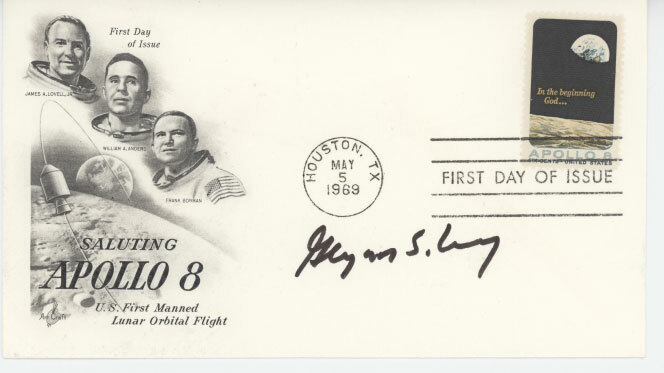 This Fleetwood cover featuring a Skylab cachet and cancelled Houston, TX on 5/14/74 honors the first day of issue for the affixed Skylab stamp. It is hand signed by Glynn Lunney who adds, "Program Manager for the command ships for Skylab" Excellent condition. 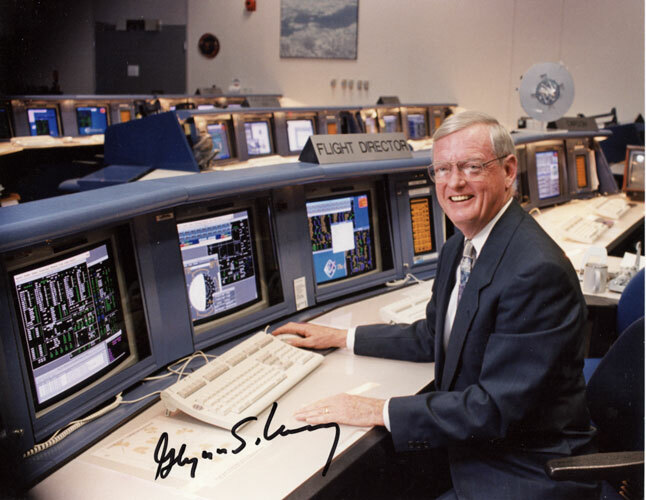 This 10" x 8" color glossy of Glynn Lunney sitting in front of the Flight Director's Console is hand signed by Glynn in black sharpie. It is in pristine conditon. This 7" x 5" color glossy is hand signed by Glynn Lunney. It is in pristine condtion and signed in fine black sharpie. Art Craft Apollo 8 first day of issue for the "In the Beginning" stamp. Cancelled Houston on May 5, 1969. Pristine condition and hand signed in black sharpie by Glynn Lunney. 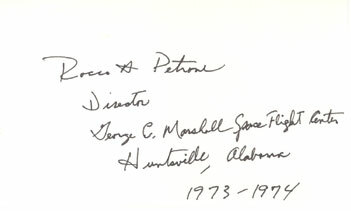 This 3x5 index card was hand signed by Rocco Petrone who also adds "Director, George C. Marshall Space Flight Center, Huntsville Alabama - 1973 - 1974. Petrone was an American engineer who was the third director of the NASA's Marshall Space Flight Center from 1973 to 1974. Before that he was Director of Launch Operations at NASA's Kennedy Space Center from July 1966 until September 1969 and then Apollo Program Director. 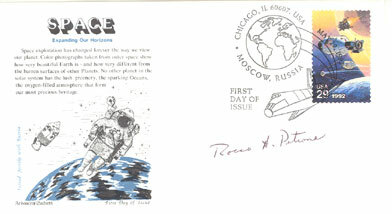 This first day of issue cover was issued jointly with Russia and honors "Space: Expanding Our Horizons". It is postmarked Chicago, IL - Moscow, Russia on May 29th, 1992. It is an Aristocrat Cachet with an simply beautiful stamp as you can see in the scan. This cover is neatly hand signed by Rocco Petrone. Petrone was an American engineer who was the third director of the NASA's Marshall Space Flight Center from 1973 to 1974. 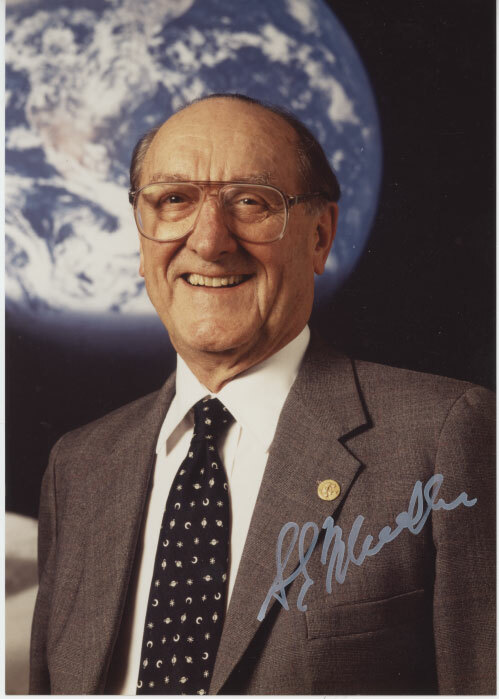 Before that he was Director of Launch Operations at NASA's Kennedy Space Center from July 1966 until September 1969 and then Apollo Program Director. This Artmaster first day of issue cover for the "Comprehending the Universe' stamp has been hand signed by Rocco Petrone. It is cancelled on May 21, 1981 at Kennedy Space Center. 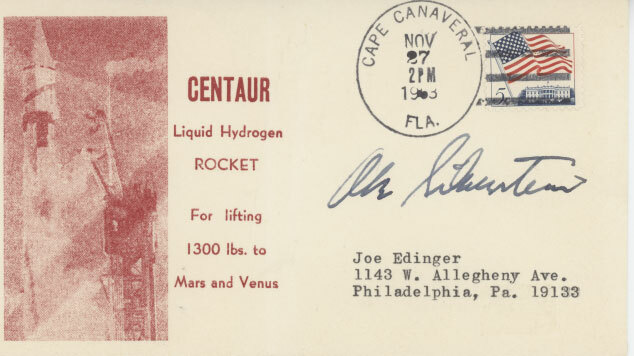 This Centaur launch cover is cancelled at Cape Canaveralon November 27, 1963. It marks the launch of the Atlas-Centaur rocket (AC-2) which demonstrated the first successful use of liquid hydrogen for propulsion of a space vehicle. Making this most desirable is that it's hand signed by Abe Silverstein who a very early and key leader in earliest days of NACA/NASA. A somewhat difficult signature to find. 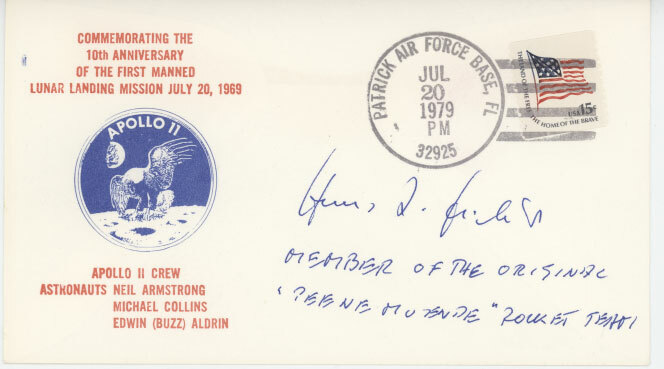 This first day of issue cover is hand signed by John Gossett who servied as Chief of the Centaur Launch Operations Division.at KSC. It was cancelled July 20, 1978 at Hampton, Virginia. 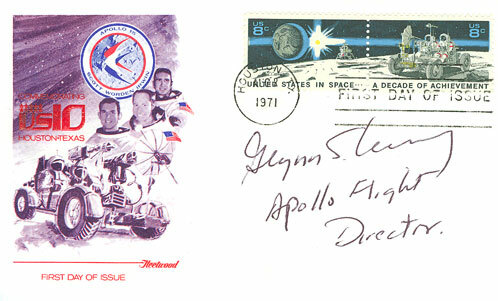 Fleetwood cover featuring a Skylab cachet and cancelled Houston, TX on 5/14/74 honors the first day of issue for the affixed Skylab stamp. 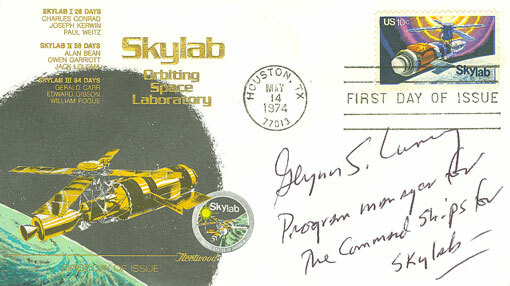 It is hand signed by Glynn Lunney who adds, "Program Manager for the command ships for Skylab" Excellent condition. This 5" x 7" glossy photo of George Mueller is hand signed with felt tip pen. Mueller was an Associate Administrator for NASA and headed the Office of Manned Space Flight from September 1963 - December 1969. Excellent condition. This 8" x 10" official NASA (worm) glossy photograph has been hand signed by James Fletcher. 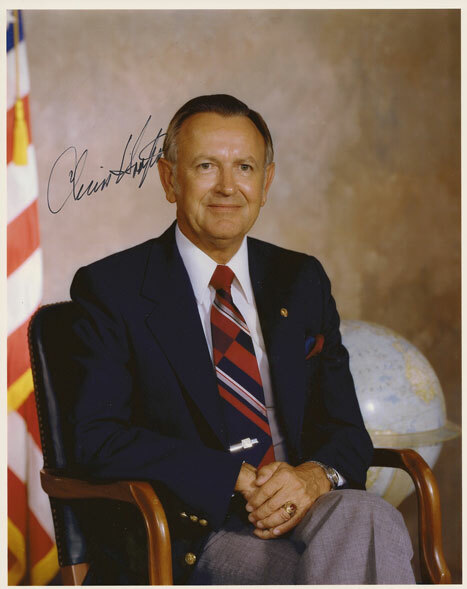 Fletcher was the 4th AND 7th Administrator of NASA. First from April 27, 1971 - May 1, 1977 under President Nixon and again from may 12, 1986 - April 8, 1989 under Ronald Reagan. His signature is in black sharpie. The photo itself has a few minor dents but is over all in excellent condition. Offered here is an autographed origional studio portrait of Dr. Kurt Debus. 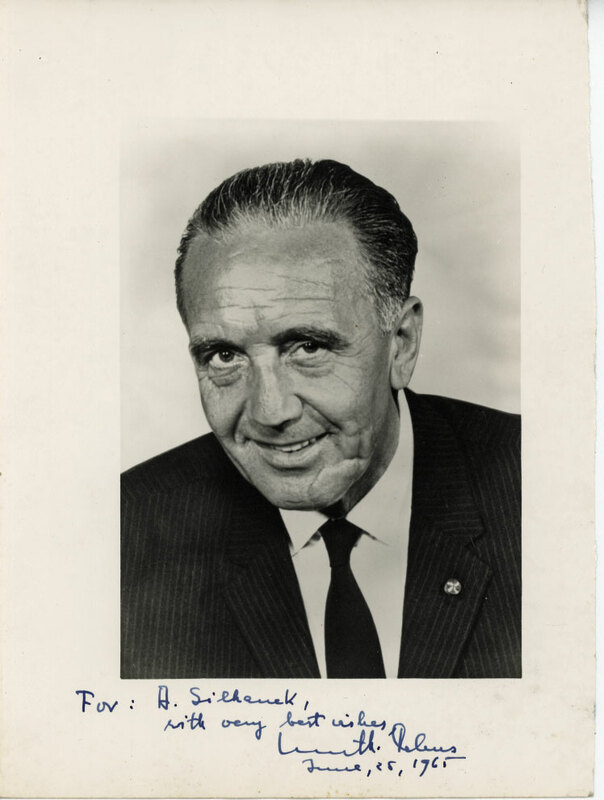 From his beginnings as a German V-2 rocket scientist during World War II, he went on to become the first Director of NASA;s Launch Operations Center (KSC). THis was a position he held from 1962 - 1974. 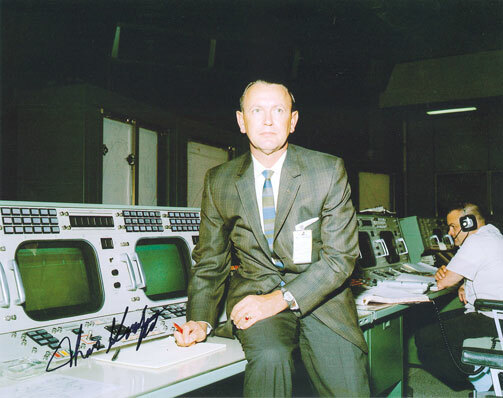 For this, Dubus became known as "Father of the Kennedy Space Center"
This photograph has been hand signed and personalized in blue ink with the date of June 25, 1965, during the heyday of our early manned space program. One inch of the right border has been trimmed leaving the measurements at 7" x 10". It still contains a massive border on all four sides.and would frame up beautifully. It is otherwise in outstanding condition. You'd be hard pressed to find one nicer of Debus in his prime during the NASA years. I've seen a few out there but none any nicer than this. 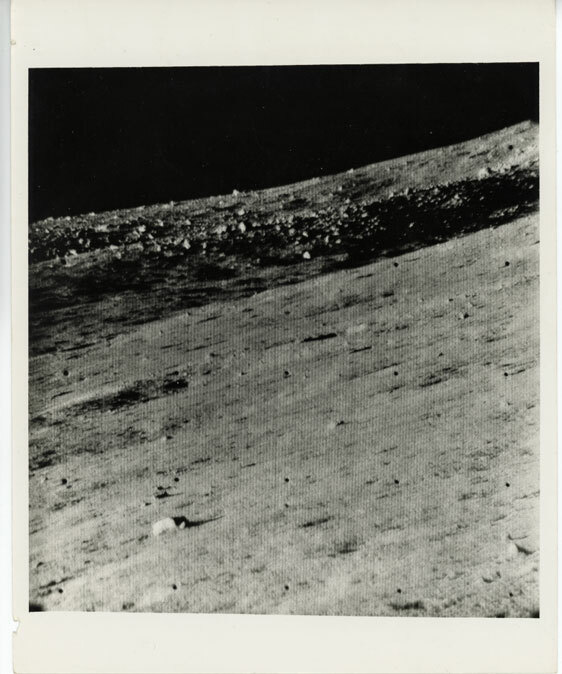 Offered here is a vintage photograph of a scene shot by Surveyor VI which landed on the moon on November 10,1967. It was one of several robotic landers that helped pave the way for our first manned missions. 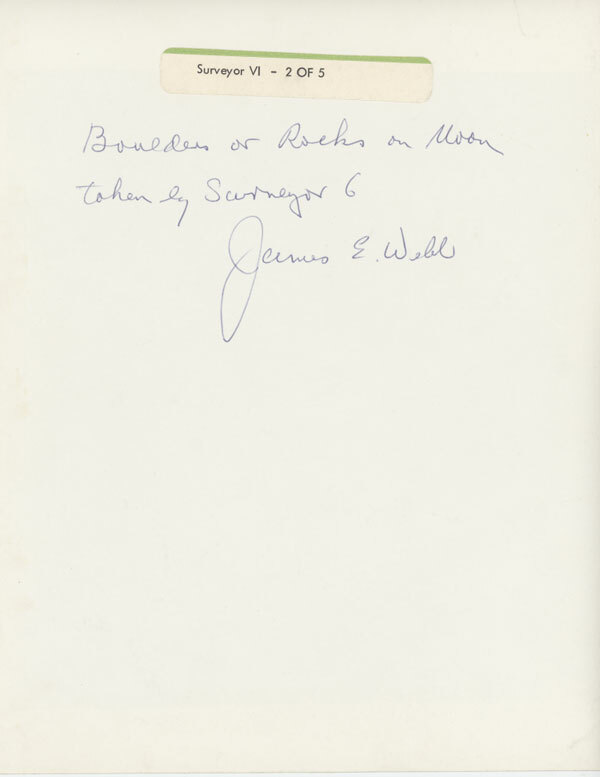 The reverse of this 8" x10" image is hand signed and inscribed by NASA Administrator James Webb who adds, "Boulders or rocks on Moon taken by Surveyor 6" . 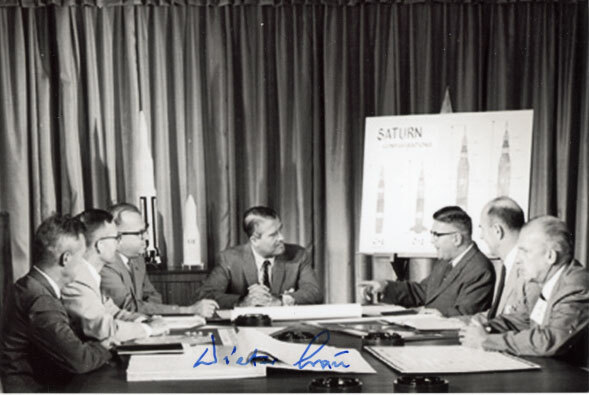 This 8" x 10" uncommonly appealing glossy has been hand signed by SIX of von Braun's Rocket Team. 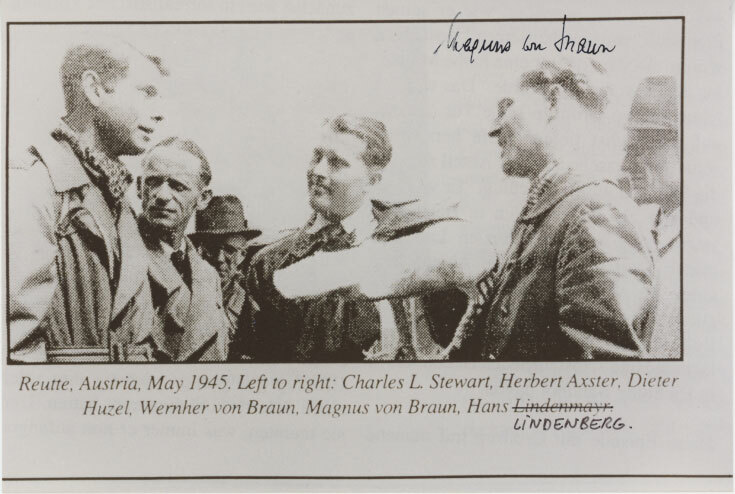 They are from top to bottom, George von Teisenhausen, Heinz Struck, Hans Fichtner, Oscar Holdrer, Dieter Grau and Dr. Walter Haeusermann. A brief bio of each is included on a seperate printed page that accompanies this photo. Of particular interest is that von Teisenhausen who was the last living member, passed away on June 3, 2018 at the age of 104. His signature is included here. These six representatives of von Braun's Rocket Team on this brilliant image would make a wonderul framed display for any collection. Herman Oberth hand signed 4" x 5.75" photo card. Signed in felt tip pen. He was an Austro-Hungarian German Physicist and Engineer. Oberth is widely considered the founding father of rockets and astronautics. Pristine condition. This Itailan "Kim Cover" commemrates the flight of Apollo 17. It is cancelled in Vatican City on 12/14/72. Making this exceptionally interesting is that it has been signed by both H. Oberth and James Abrahamson. Abrahamson was among many things, a USAF Astronaut, serving the Air Forces's Manned Orbiting Laboratory Program from August 1967 until it was canceled in June 1969. He never actually flew.but enjoyed a long and distinguished career in aviation and space. He was considered a "designated" Astronaut. Exceptional Herman Oberth hand signed Peenemunde comemorative cover. My German is poor so can't say much more about the background of this cover excepti that it was cancelled on 6/16/90 and apppears to be one of only 600 produced. 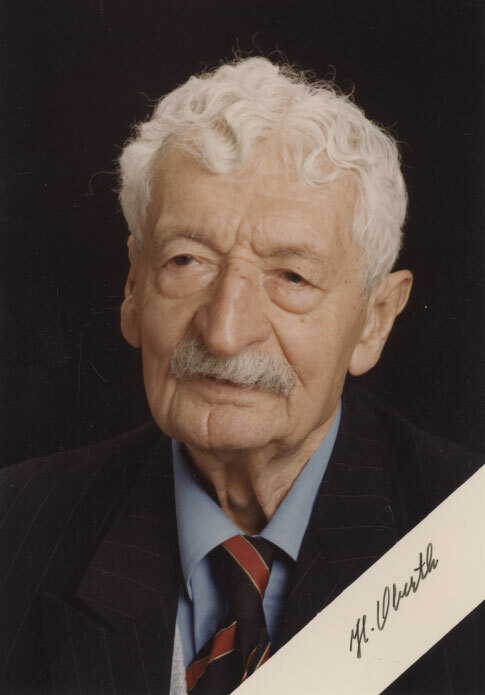 Oberth was an Austro-Hungarian German Physicist and Engineer. He is widely considered the founding father of rockets and astronautics. 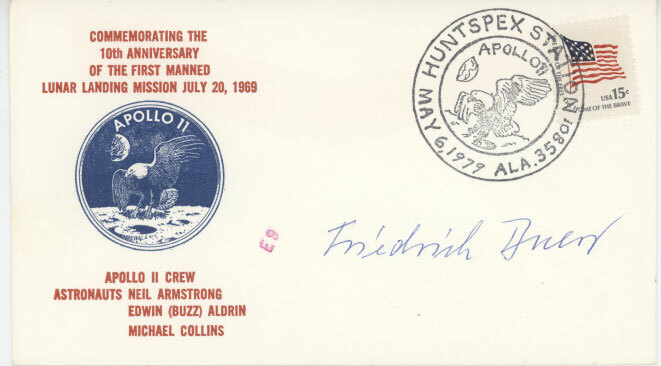 Cover commemorating the 10th Anniversary of Apollo 11 hand signed by von Braun Rocket Team Scientist Rudolf F. Hoelker. Cancelled March 30, 1979, Chicago, IL. 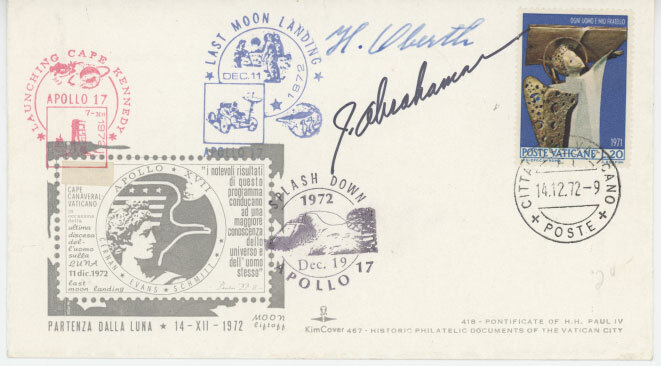 Cover commemorating the 10th Anniversary of Apollo 11 hand signed by von Braun Rocket Team Scientist Joechim Muehlner who adds, "Doppler Trajectory Measuring System, V-2, Peenemunde, 1940-1945." Cancelled May 6, 1979 at - Huntspex Station, Alabama. Cover commemorating the 10th Anniversary of Apollo 11 hand signed by von Braun Rocket Team Scientist Oscar Holderer "von Braun Rocket Team member since 1943." Cancelled February 10, 1079 at Eupex '79 Station, Eucud, Oh. 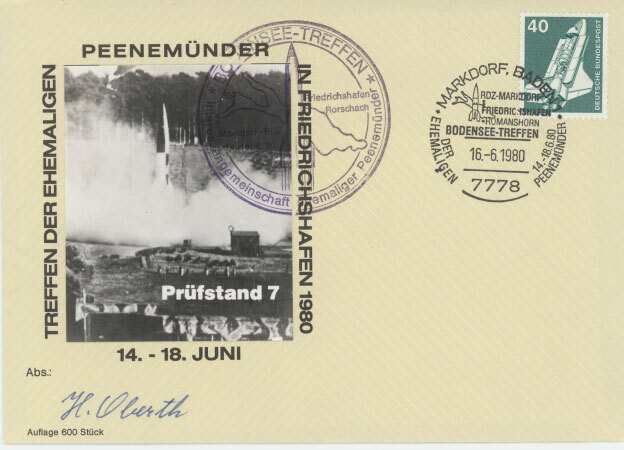 Cover commemorating the 10th Anniversary of Apollo 11 hand signed by von Braun Rocket Team Scientist Hans Fichtner who adds, "Member of the original Peenemunde Rocket Team" Cancelled July 20, 1079 at Patrick Air Force Base, Florida. 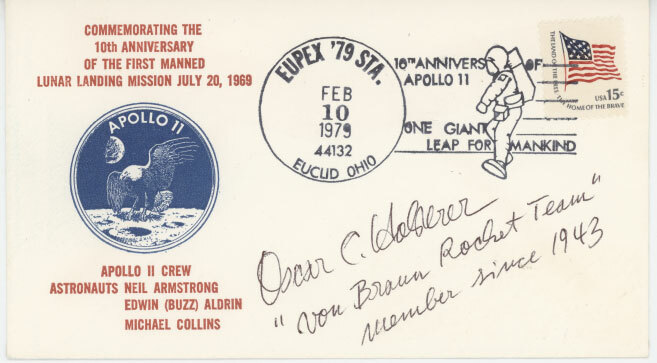 Cover commemorating the 10th Anniversary of Apollo 11 hand signed by von Braun Rocket Team Scientist Konrad Dannenberg who adds, "Rocket Propulsion Engineer, V-2, Redstone, Juper & Saturn Series" Cancelled July 20, 1079 at JPatrick Air Force Base, FL. 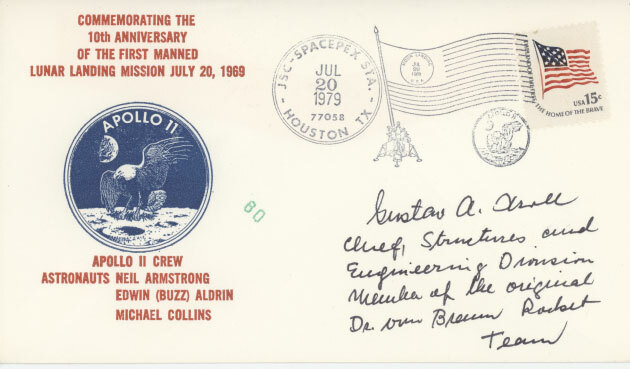 Cover commemorating the 10th Anniversary of Apollo 11 hand signed by von Braun Rocket Team Scientist Gustav Kroll.who adds, "Chief, Structures and Engineering Division. Member of the origional Dr. von Braun Rocket Team" Cancelled July 20, 1079 at JSC - Spacepex Station, Houston Texas . 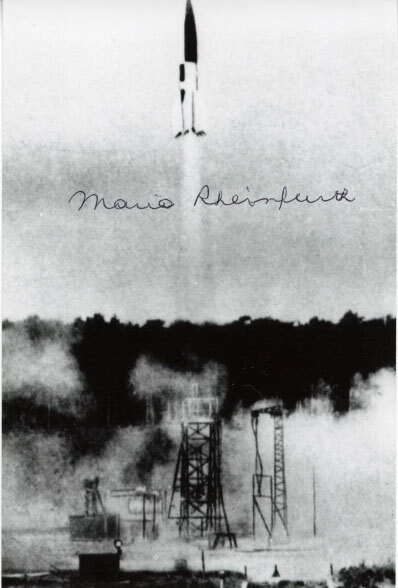 Photo measuring 4" x 6" hand signed by von Bruan Rocket Team Scientist Mario Rheinfurth.